…it’s gonna be all portraits of characters from advertising, sports, and tabletop games. Mascots, spokespersons, old, new, humans, animals, other—as long as they’re fictional and somewhat famous—all are fair game. I think the fields of advertising (throughout history) and sports (let’s keep it collegiate and up) are pretty straightforward, but “tabletop games” can encompass boardgames, RPGs, card and dice games, kids’ games, etc. Basically any games except video games. No video game characters! An important note is that we’re going back to 2 pieces per artist this year, consistent size & orientation. All media, shapes & sizes encouraged. But I’ll expect your 2 pieces to be framed or mounted, or wall or pedestal-ready in some way. So here’s what I did. 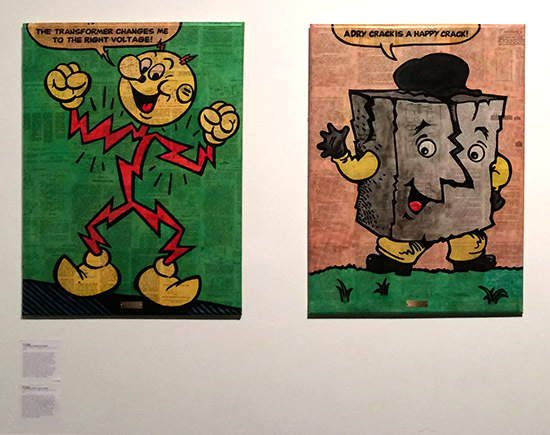 I actually run a site dedicated to Reddy Kilowatt so he was a given. I really couldn’t figure out what character would go well with him. Really. So these two guys don’t have anything in common aside from the fact that both are interesting and unusual mascots. I bought a couple used books on electricity and engineering, attached various pages to wood panels (front and back), inked in the characters, then painted over everything in watercolors and Mod Podge. 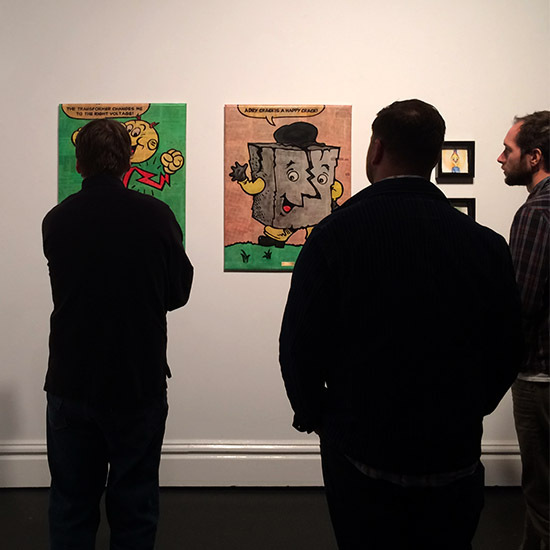 The opening was last night and Reddy sold. Not sure how long the exhibit will be up but stop by Mad Art to see all the cool work! 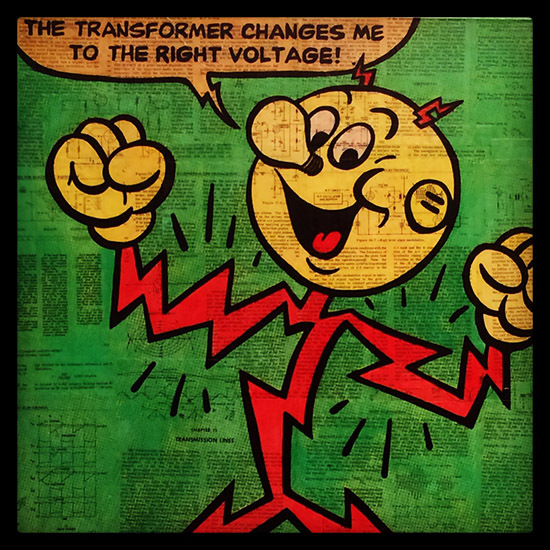 Created by Ashton B. Collins, Sr. of the Alabama Power Company, Reddy Kilowatt is a corporate “spokesthing” for electricity. He debuted March 11, 1926 and was used by more than 300 electric companies across the United States and abroad for sixty years. He has lightning-bolt/electric current shapes for his body and a head with a light bulb for a nose and wall outlets for ears. He is perpetually happy. Reddy was a frequent presence in utility publicity material until energy conservation replaced energy production as a national goal. In 1998, he was bought by Northern States Power Company, which created a subsidiary, Reddy Kilowatt Corp., to manage the cartoon. Created by Bob Kodner (and his cousin) of The Crack Team, a St. Louis-based firm in the business of home foundation repair and waterproofing, Mr. 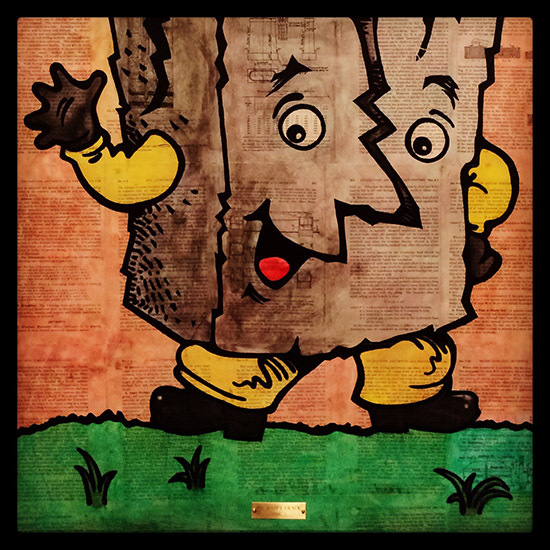 Happy Crack, is a strange and celebrated mascot. I contacted the company and they told me “Mr Happy Crack was born in Bikini Bottom. He is the cousin of the famous actor SpongeBob SquarePants. SpongeBob went on to fame and riches while Happy is stuck filling people’s wet cracks.” They think he debuted in 2000. With no marketing, the character has become an unexpected Internet sensation and apparel juggernaut, bringing in millions of dollars of revenue for the company. Here’s what I did last year.